The world is about to change as the skies fill with drones. No, not the drones you used to video yourself with, taxi drones that can actually carry passengers. Now the first example of one of these future taxis has taken flight. Alpha One, as the flying vehicle is known, was created by specialist Vehana in conjunction with Airbus. The idea was to combine the best of the world of drones with the modern convenience of a taxi service. The result is an electric vertical-take-off-and-landing (VTOL) drone that can actually fly itself. Think giant drone with space for a person to sit in the middle. The Alpha One uses electrically powered motors to drive the eight propellers which generate flight. At this early stage the 5.7 metre long vehicle has flown, with a total weight of 754 kg. However this was just a self-flying take off and landing, more flight tests are yet to come. The point is that this is a step in the airbound direction which could lead to your future Uber landing in front of you rather than pulling up alongside. It could also mean you won’t have a driver to chat to as these things will be flying themselves. 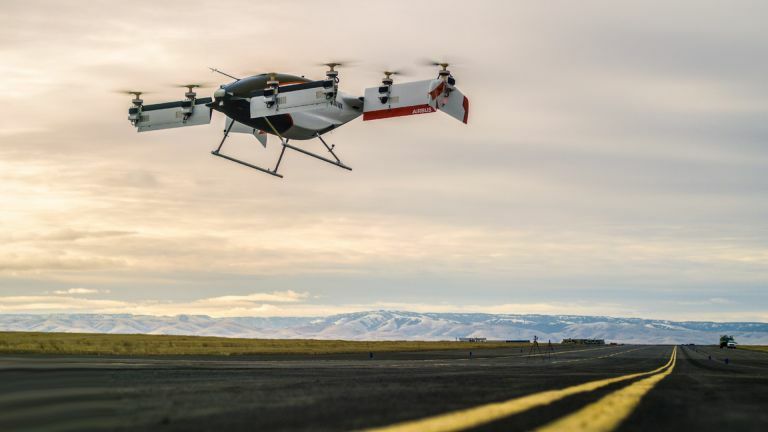 Since self-driving cars are still a while off we’re not getting too excited about autonomous flying vehicles just yet as they will likely take even longer to get perfected and through legislation as safe. But with electric flight making these environmentally friendly and theoretically affordable for all, this is a very exciting development indeed.